The plotaroute.com route planner is already one of the most sophisticated online route planners available, but today we've taken it to a new level by adding the ability to show multiple variations to a route on one map. Our new Plot a Detour feature enables you to show shortcuts, extensions, diversions or indeed any type of alternative way that deviates from the main route. Detours are shown on the map with dashed lines in a variety of colours. They are 'hot swappable', so you can easily make them part of the route by clicking on them. 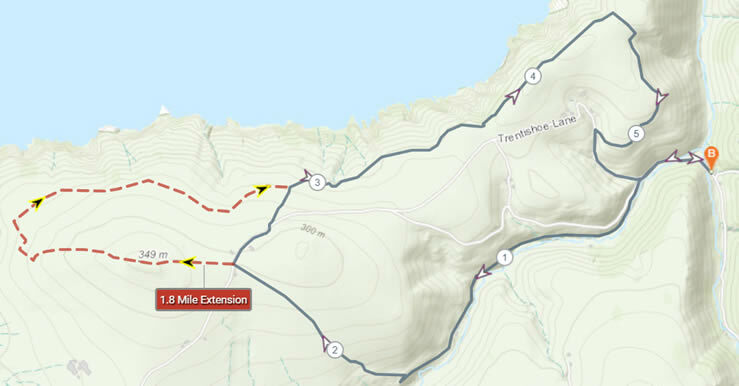 This makes it very quick and easy to see how detours affect the length of the route and its elevation profile, by simply toggling between the detour and the main route. To see how detours work once added to a route, take a look at the following example: example of a route with a detour. We've written some instructions for plotting detours, which you can find in the Tips and Tricks section of the site and we've also produced a short demo video, so you can see this new feature in action. We believe that there are many potential use cases for the new Plot a Detour feature and it's been one of our most popular feature requests, so we're very pleased to have been able to introduce this right across the site. We hope that lots of you will find it useful.